When I opened one of my birthday cards last month, inside was a miniature tarot card. Now I love this kind of thing, so couldn't wait to look in to the meaning of the card. I thoguht I could incorporate this in to my Fast Five and show you 5 different designs of the same card. 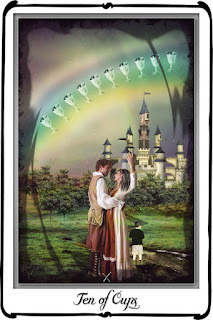 On the Ten of Cups we see a loving couple united by the bonds of true, everlasting love. They not only have each other but all that they wish for in life as well, represented by the two children frolicking at their side and the small but comfortable home in the distance, surrounded by trees and water. 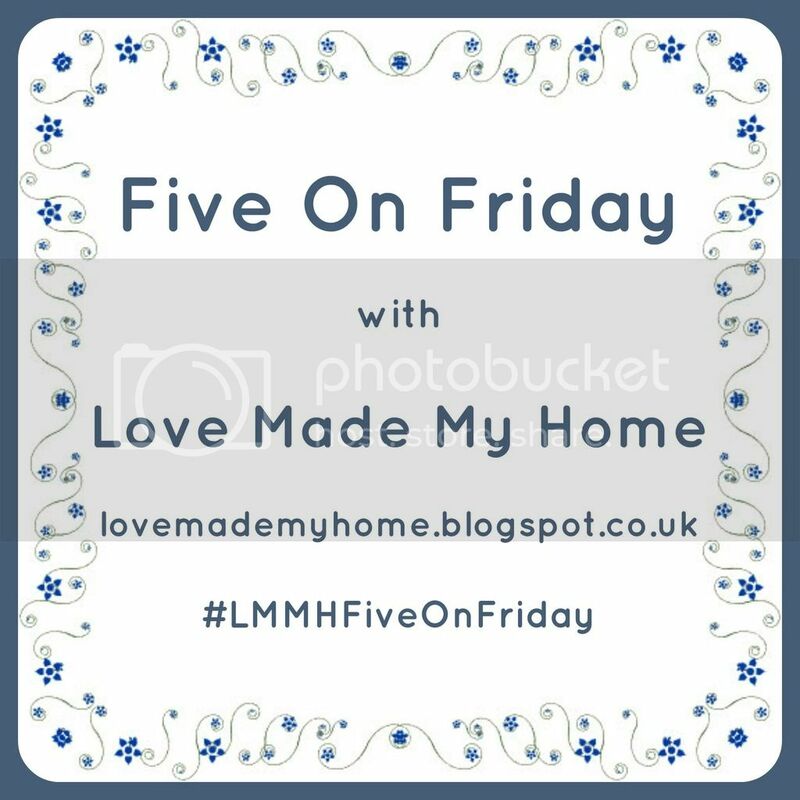 The family home symbolises stability and homely comforts, while the green garden symbolises fertility and the river symbolises a free flow of feelings. 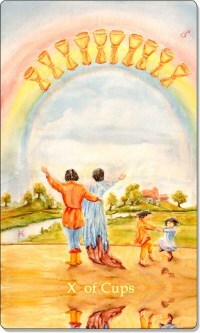 A rainbow of cups is overhead, blessing the scene. The cups symbolise an abundance of heavenly gifts and the rainbow signifies the end of hard times and is also is considered to be a highly spiritual omen in many of the world’s religions. It is a sign that the idyllic scene we see represented has been blessed from above and reinforces the idea that the achievement of perfect love is one sure way of experiencing the glory of the heavens here on earth. The Ten of Cups embodies happiness, joy, contentment and emotional fulfilment, particularly in the area of your relationships and family. It represents almost an idyllic state of peace, harmony and love where all your dreams and wishes have come true and you are delighting in your good fortune. 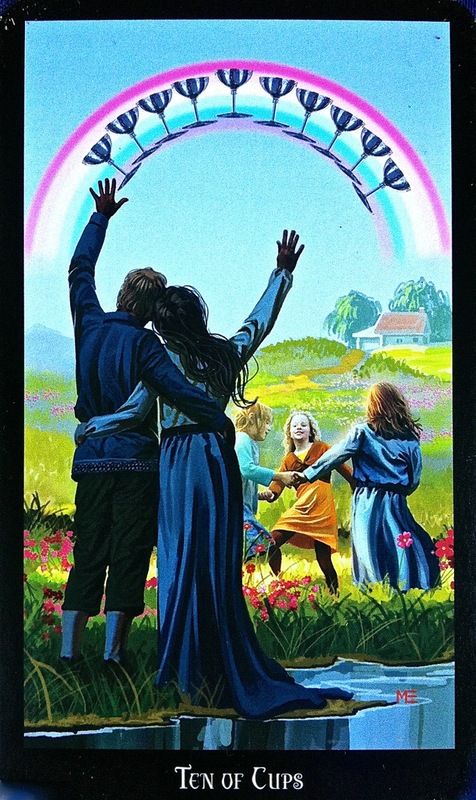 Given it is a Ten, this card indicates attainment of this idyllic state so stop for a moment to appreciate everything that you have accomplished and be incredibly grateful for the blessings that fill your life right now. 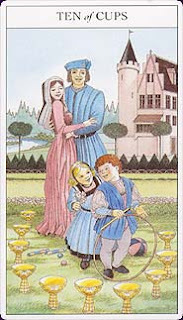 With the image of a happy family and a comforting home in the background, the Ten of Cups is indicative of a harmonious and loving family life. All family members are getting along with each other and there is a lot of happiness and love shared. No-one is fighting or causing any tension. Instead, it is an environment of peace and happiness that lends itself to warm and loving relations. 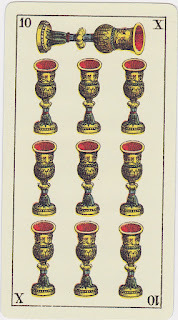 The presence of the Ten of Cups may even reflect an upcoming family holiday where you can rest and relax together, creating fun and happy family memories. There may be a family reunion or a family celebration where members of your extended family come together. 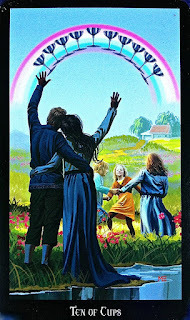 This is a wonderful time to bond with your family and lay the foundation for a happy and harmonious future together. 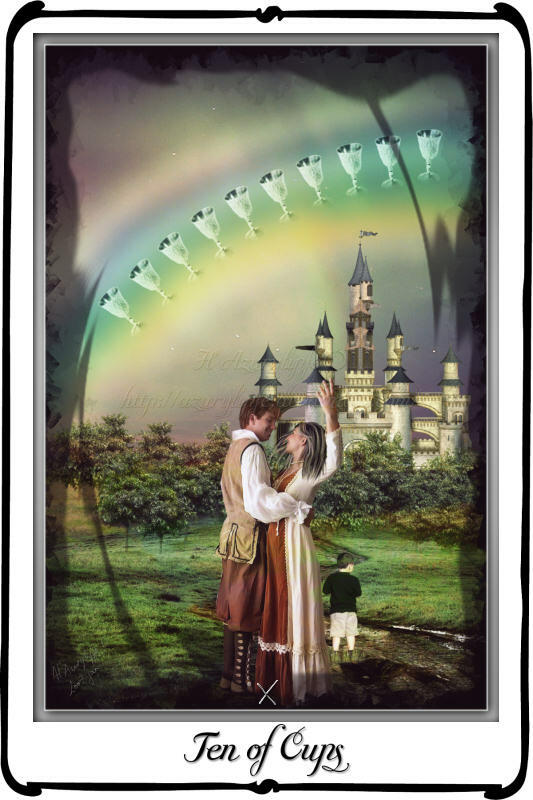 The Ten of Cups is also a very positive card in terms of romantic relationships and may indicate either the beginning of a new, very happy relationship, or the ultimate satisfaction of a long-term relationship. Commitment and love are the requirements of such satisfaction, yet this card promises that with the required effort a lasting love can be built. The time will also be made for the enjoyment of pleasures, which may be shared with another person whom you love. Outside of relationships and the family, the Ten of Cups is also reflective of your personal values system and what you believe will bring you the ultimate fulfilment and happiness in your life. This card represents a time when you are very clear on where your personal beliefs and values lie and you have successfully created a life that is aligned to those values. It may reflect a spiritual or religious person who lives in peace and harmony. It may also reflect strong family values that were instilled within you early in life which are now helping you to create a fulfilling lifestyle. The Ten of Cups encourages you to follow your heart and go with your intuition about where the best opportunities lie. As an intuitive person, you know that you can trust your gut feeling to guide you. When you feel truly happy and inspired about something, you know that that is the way to go! Aim to seek out opportunities that make you feel fulfilled and that are aligned with your personal values, rather than simply following the path that others expect you to take. You have to do what feels right to you and you only. Whether you believe in the supernatural or not, the words gave me great comfort and reassurance that we are on the right track. I'd love to hear your thoughts on the card/meaning or the whole divination topic. Do you believe? I read the horoscopes every day. My "boring" self says it's just for fun....but deep inside, I'd like to believe in them. I've always wanted to have a tarot reading, but sensible hubby would probably tease me about it. And what if it wasn't GOOD news?????? And also--yours was fantastic. I hope it's all true for you guys! I don't know anything about Tarot. Here in Appalachia it's associated with the occult and that's a good way to get your house burned down. Southern Baptists are not noted for being particularly open minded on such thing. We still have witches up here, I kid you not. But that card you have seems to portend the best, so what's the harm in believing in it. It IS of the occult - something I totally avoid as a Christian. Gorges, you old party pooper! I'm going to pay a witch woman to put a hex on you! Matthew 7:1 Judge not, that you be not judged. The Christians burnt the witches at the stake and drown them, but the Viking Heathens burnt down all the churches so I guess the faiths are even. I know Gorges, I'm sure he didn't mean any harm. He's a good fellow and would never intentionally give offense. I'm not a Christian, myself, but I try to get along with them. I'd have been a good Viking, born too late in the wrong time, I'm afraid.